Following the Japanese earthquake in mid March where the dollar yen promptly sold off sharply, before G7 intervention managed to send the pair back to the 86 level, since then the dollar yen has been on a downwards slide back towards the 80 level where we have seen an extended period of sideways consolidation for the past few months. Yesterday’s price action finally broke out of this sideways movement, breaking through the strong level of support in the 79.80 area to close at 79.46 as a wide spread down candle, albeit one with a deep wick to the lower body. 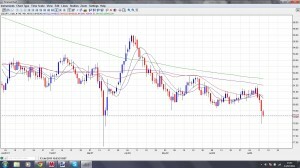 This bearish sentiment has continued in early trading this morning with the pair moving lower once again to trade at time of this video, at 79.26Throughout the recent extensive consolidation phase the 100 day moving average, in particular, proved to be a significant barrier in any rally and coupled with the shorter term moving averages, these should now combine to produce additional downwards pressure. Indeed the 9 day moving average has now crossed below the 14 day moving average to give us a bear cross signal, adding further weight to any downwards move. With the deep area of price resistance now above – between 80 and 82 – the dollar yen looks set to fall further, possibly to re-test the lows of early March in the 76.50 area, although as always this assumes that the Bank of Japan does not intervene and, of course, the stronger the Yen becomes, then the more likely this is to occur.